Not posted for ages, not had much to say, not been doing much since August; how has so much time gone by? New Year, I stayed at Mar Lodge it was very cold but not much snow. It was also very windy so we stayed low but enjoyed some nice long walks. 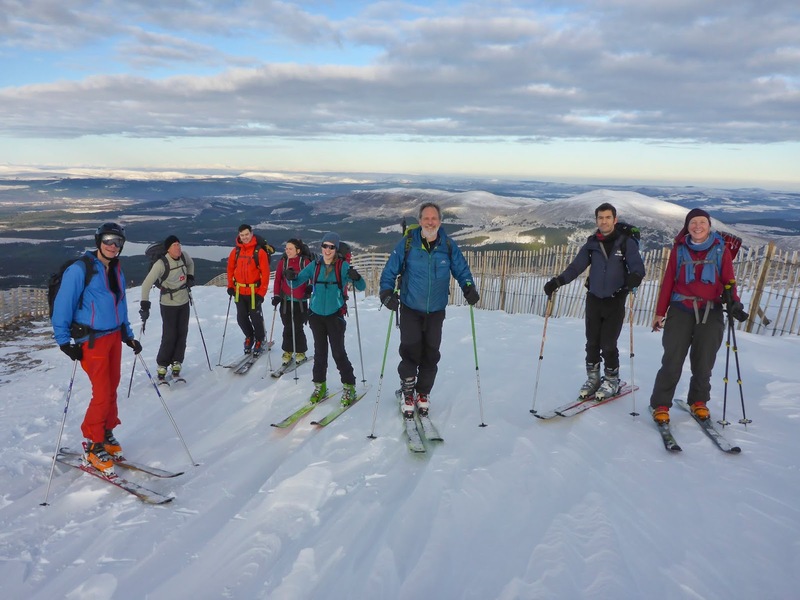 In January I went to the Cairngorms with the ski club, there was still not much snow. We did manage to find something but a lot of skis were damaged that day. In February, I went on another ski club meet at the Raeburn Hut near Dalwhinnie. What snow there had been had gone. We went for a walk in the rain, I didn't take any photo's that weekend. I have been out trying to improve my wildlife photography. Here's some birds. Last week I went back to Cairngorm as there had been quite a good snow fall. Unfortunately, I managed to ski off a 4ft drop. I've broken a bone in my ankle and torn my ACL. This could put me out of action for a couple of months. Just before that the firm I was working for went bust. So now I'm looking for work with a limp. I'm not sure what to do now, I may look into early retirement. Everything seems very unsure at the moment with the country tearing itself apart and no one having any idea of what going to happen. Braeriach with the Atompack Prospector Pack. My new pack finally arrived from Atompacks, it's really nice but ten weeks is a long time to wait. Once it came it seem a shame not to try it out, so on Friday evening I drove up to Aviemore in the pouring rain. Luckily, it stopped before I got there. I parked at Whitewell and headed up Glen Einich, I walked for an hour or so until I came to the edge of the Rothiemurchus forest. Here I camped in what was the worst midgie site I've used for ages. I resorted to a Tiger coil which never fails to clear them out of the tent. It rain all night but had stopped by the time I got up in the morning. The new Atompack Prospector. with water one side and tent the other. The tent could have gone inside but it was wet. There's a good path from Glen Einich up into Coire Dhondail and up on to the plateau. A short walk up hill took me to the edge of the massive An Garbh Choire. It has been speculated that the last glacier in Britain was in this coire. I'm not so sure, some of the science this claim is based on is decidedly dodgy. It's mainly radio-carbon dating of the lichens on the scree in the coire floor. Still it is a spectacular place. Carn Toul and Sgor an Lochain Uaine (Angel Peak) from near the Falls of Dee. My campsite near the Falls of Dee. Back in the Rothiemurchus forest. I camped by where the Falls of Dee start, I've used this site before and really like it. I thought "I'll just have a brew and then I'll go up to the summit of Braeriach and take some photo's. By the time I'd finished my tea the mist had descended and I couldn't see more than a few feet. By morning it was no better and it was raining hard. I had to use my compass to find the way down. I dropped down into the Lairig Ghru and follow the path back into the Rothiemurchus forest and back to the car. The rucksack was very comfortable and dry inside, has some nice pockets and should be a good size for shorter trips up to about four or five day I think. I love seeing wildlife whilst I'm out walking but I've never been that good at capturing it on camera. Not that I have a decent quality DSLR camera and lenses I'm keen to have another go at getting some better pictures. These are some of my first try, their from Morton Lochs which is near Tentsmuir in Fife. Mallaig, the long stay carpark sign says “Max stay 7 days” Mallaig is my kind of town. I've just enough time for a quick brew before boarding the ferry. I find a place to sit on deck but I'm quickly surrounded by a group of Glaswegians, middle aged, over weight men well on their way to being pissed. Their good natured but very over excited, a boys weekend away. They're rather crowding me out so I move to stand by the rail for the 45 minute journey to Inverie. I've paddled this bit of coast many times but this is my first time on the ferry, interesting to just stand and pick out landmarks, places from past trips. The quay at Inverie is all hustle and bustle, people arriving, people leaving, people picking up parcels, meeting people. I grab my pack and head up the track into the woods. Somehow I end up on a mountain bike track but it loops back to the main track. Soon I'm out of the village and heading down a track to another wood, here the track splits I take the right-hand one. Further on I find a clearing, it's obviously well used, an ugly fire ring right in the middle, but it's clean and close to water. I set up camp and chill out. I'm away by 07.00 in the morning, I cross the stream and head up, even this early it's hot. Up and up, views open out behind me – Egg, Mull, Canna, Point of Sleat. The first section of the route is brutal straight up onto the ridge. At the Bealach the angle eases, real walking in the air feeling. Behind all the way out to the islands ahead Loch Hourn, Sandaig and the ridge up to the summit, Ladhar Bheinn. On top I pause try and take it all in, is that the Forcan ridge or the South Sheil ridge? Then on eastwards along the ridge down, up, down, up. I've walked this ridge - twenty something years ago - I really don't remember it. Then I'm scrambling, it gets hard, I take off my pack and let it slid down before me. My ridge joins another, a T-junction, turn right over a minor top Anonach Sgoite to a bealach – Màm Suidheig. Below me the Dubh Lochain my goal for the night, but there's no path. Just a sea of Bracken, a jungle. I zigzag down trying to find a way through, I find a dry burn and follow it, the midges swarm – bastards. Then I'm down, I cross the river but it's all tussocks and sphagnum moss nowhere to put a tent. I follow the river down, here I meet a couple who have also just fought their way down off the ridge. Americans, from Boston we curse the Bracken and the Midges. Further down something big moves in the bushes, cattle. I shoo them out of the way and carry on, a squeak from behind sends me running back to rescue the yanks. “Wow, I've never been this close to one before” said the Lady “she's beautiful”. Eventually I pitch for the night by a stream just off the main track, it was the only place that was very slightly less lumpy than everywhere else. With all the cattle around I had to filter my water. It has been a very long hot day, I was gagging for a drink those twenty minutes it took to fill my water bladder seemed an eternity. By the time I'd put up the tent it had started raining, it was ten o'clock before I'd finally finished eating. The rain hammered down all night, by morning there was no let up. I'd planned to climb Meall Buidhe and Luinne Bheinn but they were nowhere to be seen. I sat it out or in that small backpacking tent it was more like laid it out. I've been experimenting with different food for my mid day snacks. This time I was trying Rye Bread and squeeze cheese in a tube. Up till now this had proved fine but this time as soon as I'd finished my sandwich I was throwing up, not quite sure why. Next morning dawned dark and overcast, I decided to skip the peaks and move on. A short walk down stream lead to a bridge and the path to Glen Meadail. This is part of the main path into Knoydart from the east, I suspect it was in use long before the clearances. As such it was well made and gently graded. In six kilometers it takes you from 20 to 550m in one long easy climb. I stop at the bealach (Màm Meadail) for an early lunch, I brave the rye bread again but it was fine this time. By now the sun was beginning to break through, tantalizing views of Sgurr na Ciche and Ben Aden. Below the bealach I meet another couple, East European – Poles maybe. She all bubbly and smiles he doom and glum. “Where are you heading”. I ask. “We see how it evolves”. Was all he'd say. The east side of the bealach was steep the path cut down in a series of short zigzags. Soon I'm at Carnach, the ruin cottages by the river. The old foot bridge gone, cut and now rotting in the grass, the new one still held up in “Planning”. I wade across in this dry weather only ankle deep. The tide is in, I scramble around the rocks to Sourlies. Yet another couple, English this time, they were heading for Barrisdale but got this far and decided to just chill out. Who can blame them as it was turning into a hot and sunny day. Under the bridge that crosses the Allt Coire na Ciche I find a shady pool, I strip off and jump in, it was very fresh. In a little time I'm at the head of Glen Dessarry by the first of the Lochains I find a flat level bit of grass for the tent with a rock to sit on, what more could I want. The hot weather has dried up all the streams, the outflow from the Lochain doesn't look so good – a lot of sediment and bits in it. I hang the filter bladder off the end of my boulder, set up my solar panel to charge my camera batteries, and sit in the sun drinking tea and cooking. To get back to Mallaig I need to get up onto the ridge that makes the south side of the Glen. It's very steep and craggy, I set off slowly weaving a snaking route upwards. I surprise a heard of Red Deer, one barks and they all run away. On I climb, I crest the ridge by a small pool, ahead the ridge looks rocky but I carry on weaving my way through. The summit block of Sgurr na h-Aide stick up pointing into the sky looking for all the world like a miniature Matterhorn. From the top I see all the way down to Sourlies bay on one side and on the other I can make out the Oban Bothy and Kinlochmorar. That proved to be the last view of the day as the mist now descended. For the next ten kilometers I tentatively work my west navigating as much Braille as anything else. Around six o'clock I see a small Lochain and head for it, I was hoping the outflow was indeed flowing but no luck. The water in the Lochain is again cloudy and full of bits so I set up the tent and start to filter water once more. As I do this the rain sets in for the night. Dawn and the mist is thicker than ever. I set a compass bearing for South Tarbet Bay. Very soon I'm stood looking down on that very bay. I'm look over the top of a big crag. There's no way down, I traverse right, then there's a high Deer fence in the way. I see a style, “if there's a style there should be a path” I think. I fight my way into a stream bed and up the other side to the style, there's no path. I carry on down until I come to a footpath, this takes me to Tarbet Bay, the old church, no longer a bunkhouse, Frankie is long gone. The place is like the Mary Celeste, generators running light on but no one to be seen. I follow the track up the hill and down the other side, Swordlands also deserted. The track now runs along the Loch shore, easy going, past the old farm house at Brinacory. Past the old jetty, to the end the tarmac road. I'm just packing away my walking poles when another couple appear behind me, they'd been following me all the way from Tarbet Bay but I'd not seen them. They give me a lift to Mallaig. As I'm driving out of the town the heavens open once again. The great plans of mice and men. Well, things didn't turn out quite as planned. My winter trip to Sweden didn't happen. I was ill and didn't work through November and December, I'm still not fully fit. So I've no real idea what I'll be doing for the rest of this year. I don't know whether I'll be up to a long backpacking or kayaking trip, I may go on a photo safari working from a base camp somewhere but I've no real plans yet. Marking the passing of time. In just six weeks I turn 60, can't say I'm all that happy about this, still the more birthdays you have the longer you live. I've been thinking how to mark this momentous occasion. 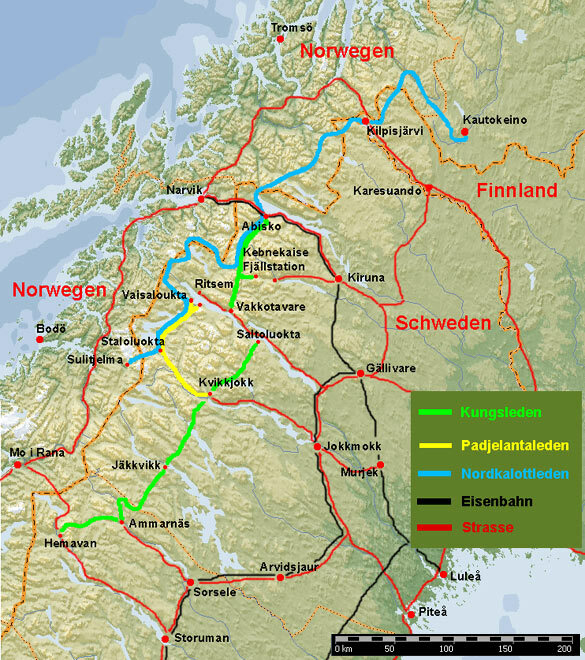 So far my plans are concentrated around going back to Sweden and skiing the Kungsleden Trail. From Hemavan at the southern end all the way up to Abisko in the north, a distance of about 450km. 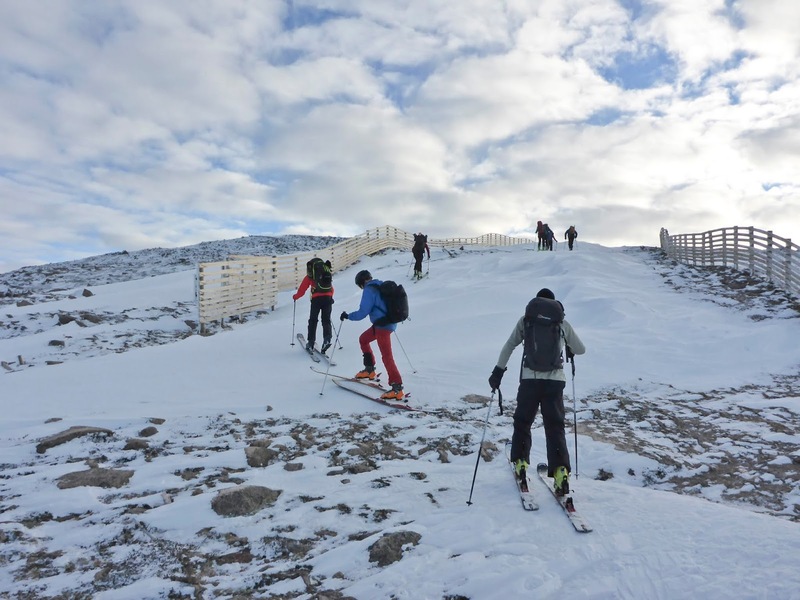 In the north and at the southern end there are huts quite close together so it's possible to ski for hut to hut. However the bit in the middle doesn't have huts, this is quite a pain as to ski the whole route I'll have to carry a tent, stove, sleeping bag etc. all the way. In all I think I'll need to camp twice and spend a further two nights in Prism huts (small unheated wooden sheds). Quite a lot of weight for such little use. Of course having the tent gives me the freedom to stop when and where I like, as the huts are quite expensive. But, sleeping out when the temperatures go down to the -20º'sC and the snow could be several meters deep shouldn't be taken lightly. Getting there is another problem, there's an airport only 60km from Hemavan, but it's in Norway. For some reason there doesn't seem to be a bus service going across the border, or at least one online. November isn't a good to go ski touring so the plan is to take march off work and go for it then.